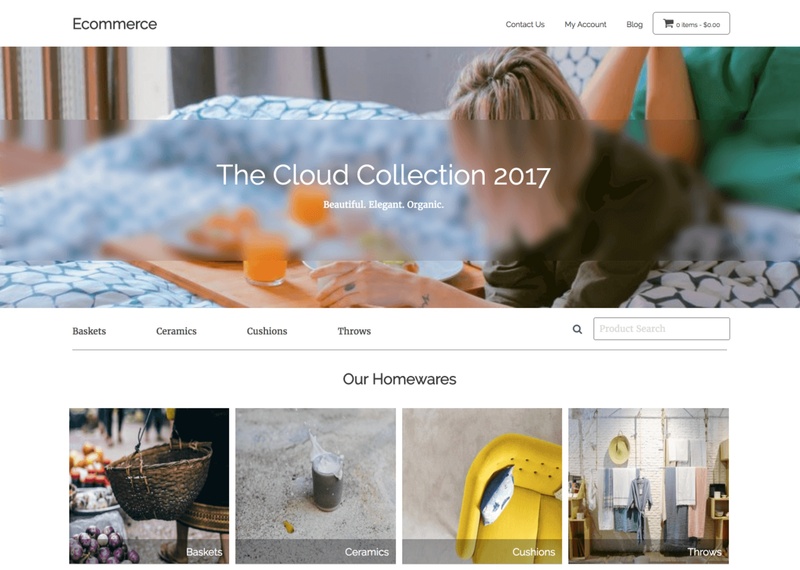 Last week, we released our new WordPress ecommerce theme, and received a lot of questions about the masked blur effect used on the banner images. This is a live effect that can be applied to any image you give it. I think it’s a nice treatment and more importantly, the general technique opens up lots of possibilities for crafty designers. I’m going to run you through what I’ve learned today. can be applied via a mask of practically any shape. is relatively well-supported in modern browsers – though mask positioning can be tricky. First up, SVG is the key to this technique. While we all know SVG is a vector format –it says so on the box – the irony is, SVG has a bunch of pixel-based tricks that PNG and JPG can only dream about. Let’s start with the basics and the simplest of filters. Setting up a basic SVG filter is as easy as creating a set of filter tags and naming the filter with a reference ID – in our case we’ve called ours ‘myblurlayer’. Adding the following SVG snippet to your page won’t render anything on screen, but it creates a new filter that you can then apply to any page element – images, text, panels, whatever. Increasing the stdDeviation increases the blur. In this example, we’ve used a simple SVG blur effect (i.e. feGaussianBlur), but there are dozens of other filter effects we could have used. Most commonly, we apply the filter using CSS. Now, this CSS class approach works fine in most browsers for simple filter effects. Unfortunately, as your filters become more ambitious, bugs in Safari make this unreliable. In the browser, this shouldn’t look any different to your garden-variety IMG tag. Later we’ll apply our filter directly to that <image> element. SVG offers a handy filter effect called <feImage> that converts images into objects that SVG can then manipulate – in our case, to use as a mask. It looks like this. Technically, our xlink:href can accept a link to an external file (for instance, ‘mask.svg’), but I had trouble getting this to work consistently across browsers. Instead, we’re going to code our SVG mask directly into the filter. Before we write any more SVG, we need to create the mask we want to use. I’m going for a very simple rectangular ‘letterbox’ effect, but there’s nothing stopping you from using any vector shape you like – though I recommend keeping your mask relatively simple. For this, I’m going to use a nice little online SVG editor called Method-Draw. It’s simple, free and should encourage you to keep your mask simple. If you prefer Illustrator, that should be fine too. When you’ve created a simple black and white shape, click on ‘View’ -> ‘Source’, and copy the SVG markup to your clipboard. To bring this mask into our filter, we’ll need to convert it to a ‘data URI’ – basically just an encoded version of our SVG markup that is easy for the browser to use, but looks like complete gobbledygook to us. Open this Data URI Converter in a new tab, click the ‘Provide text’ option and paste your SVG markup into the text field. 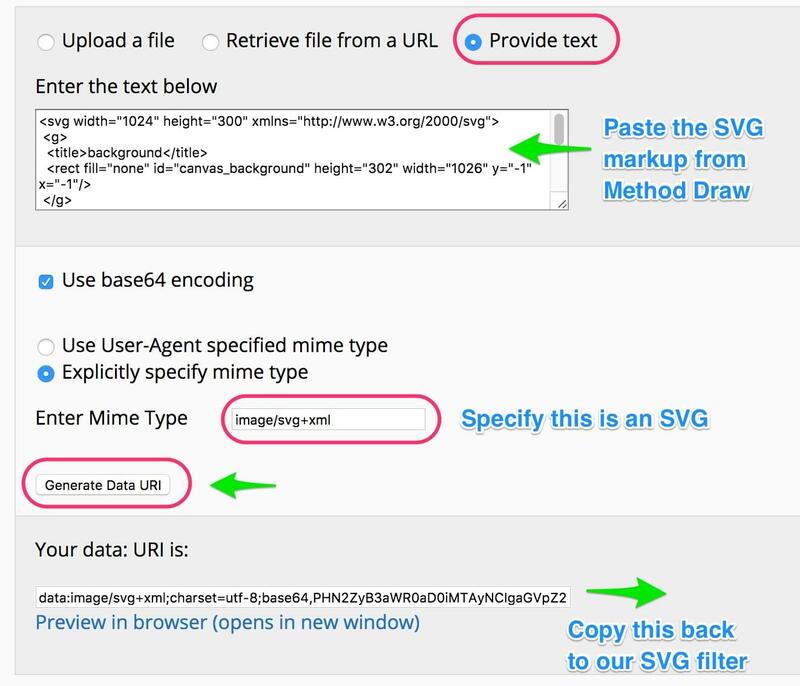 We’ll need to tell the converter we are giving it an SVG, so enter image/svg+xml into the Enter Mime Type field. When you click ‘Generate Data URI’, you get a long string of mostly random-looking characters – that’s our converted mask. Copy this to your clipboard, switch back to your SVG filter code and paste it into the xlink:href= section of our <feImage> . One of the coolest SVG features is the ability to ‘sandwich together’ multiple effects into a single image treatment. The first thing we need to do is combine our mask and the blur filter into a single entity.It’s a little like plugging different inputs into your TV. We use <feComposite> for this. As you can see, we’re taking the output from our mask (result="mask") and the output from our blur filter (result="blur") and using (in2="mask") and (in="blur") to combine them. We’re calling the result ‘comp’. Now we just need to tell the filter what to do with this masked blur – which is, of course, to apply it to any image we give it. For this, we can use <feMerge> to merge our masked blur effect with whatever image we give it. Happily, SVG understands the concept of a ‘SourceGraphic’, so we can just tell it merge ‘SourceGraphic’ with ‘comp’. Our filter is ready. We just have to apply it to an image. For the demo, I’ve embedded my source graphic – a JPG – in a separate SVG element and applied our filter with filter="url(#blurlayer)"
See the Pen Masked blur effect SVG – no color change by SitePoint (@SitePoint) on CodePen. As we’ve discovered, SVG filters allow us to layer effects on top of one another. This means we can get even trickier by adjusting the color of the masked area with the <feColormatrix> filter effect. Adding the following code to the top of our filter code gives us fine-grained red/green/blue channel control over our filter, letting us darken the masked area and increase the text contrast. The default matrix setting places ‘1’ in the places I have ‘0.7’. We’re simply dialling down each of the RGB channels. I’m not going to explain the full subtleties of feColorMatrix here as Una Kravets has already covered it far more eloquently than I could here. There’s also a nice push-button tool here shows you how different matrices effect the color of an image. Often playing with a live demo is the fastest way to learn. And here’s the final demo with the tweaked colors. See the Pen Masked blur effect that works in Safari by SitePoint (@SitePoint) on CodePen. To help keep things easier-to-follow, I deliberately went with the simplest of mask shapes in the demo above – a rectangle. But there’s nothing stopping us from using more interesting mask shapes. Here’s a more complex geometric mask combined with a more intense color effect. See the Pen Blur effect with complex mask by SitePoint (@SitePoint) on CodePen. This is fun stuff to play with and opens up a lot of visual possibilities in my mind – effects that would have previously been unthinkable outside of image editors like Photoshop. These are design tricks for designers, but you’ll need to get comfortable with code to take advantage of them. Perhaps the most important concept above is the idea that you can create multiple instances of your ‘SourceGraphic’ and apply different effects and opacities to each one. This could play put as a jitter effect, red-blue 3D hologram effect, shattered glass effects or endless variations. There’s no reason why you couldn’t animate these effects too. However, it’s also true that browser support is currently wide but – shall we say – a little inconsistent. We’ve obtained usable results in Chrome, Firefox, Safari, and IE10-11, but often, needed to try two or three different approaches to the same problem to get the outcome we wanted. Even now, I can’t explain why Safari lightens the filtered area more than other browsers. Also be aware that failing filters have a nasty habit of making an image disappear completely, so be thorough with your testing. Nevertheless, the idea of being able to apply complex yet temporary visual image treatments in the browser – and remove them at a stroke – makes SVG filters a compelling prospect for me.